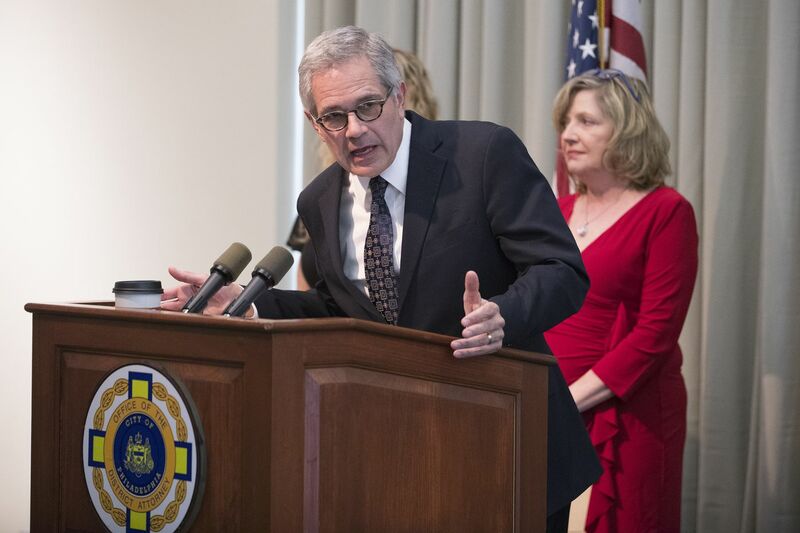 District Attorney Larry Krasner and Assistant District Attorney Dawn Holtz, right, supervisor of the Economic Crimes Unit, announced charges against Hooked Inc. and its two owners for illegal towing practices and fraudulent business practices on April 10, 2019. After an 18-month grand-jury investigation into price-gouging and insurance fraud involving car towing and wreck-chasing, Philadelphia District Attorney Larry Krasner on Wednesday unveiled charges against a North Philadelphia tow-truck operation and its two owners. He said the industry standard for towing charges is from $200 to $400, but that his office logged calls from insurance companies that did business with Hooked and said they were being billed from $1,000 to $2,500. “Ultimately, this is a story about greed," Krasner said. Assistant District Attorney Dawn Holtz, supervisor of the Economic Crimes Unit, said the charges involved four victims whose insurance companies were overcharged by Hooked. While the grand jury in this case has concluded, she said, there is an ongoing investigation into other tow-truck companies, and she hinted that future charges may be lodged. The charges against the defendants stemmed from incidents from 2016 to 2018, she said. In one, Krasner said, a woman who was in an ambulance after getting into an accident in Roxborough was approached by a tow operator, who told her she had to sign a tow slip to have the car removed from the road. Her husband signed the form. Hooked billed Allstate Insurance $1,221 for one day, which included a tow charge, labor and storage costs, and other fees, Krasner said. Moreno, Williams, and the company were charged last month with felony counts of conspiracy to run a corrupt organization, theft by deception, deceptive business practices, and insurance fraud. The grand-jury presentment remained sealed until a judge ordered it made public on Wednesday. Defense attorney William J. Brennan, who represents Williams, signaled the defendants would fight “each and every” allegation. Defense attorney Amato Sanita, who represents Hooked, said the towing by the company was “always with the consent of the individuals who are having the towing done.” He added that the company is operating and its license remains active. Moreno’s attorney, Richard J. Fuschino Jr., said his client denies the accusations. Holtz, when asked about Fuschino’s comment, said that wasn’t the case and maintained that consumers were being defrauded. Moreno, 47, whose home address is the same as the company’s, according to public records, and Williams, who turns 30 on Thursday, of Northeast Philadelphia, surrendered to authorities March 19 and were released on recognizance. A call to the company’s number Wednesday went unanswered. Williams has four open theft charges from an unrelated January incident, court records show. Brennan said he plans to fight these charges, too. He said Williams had gotten approval to tow four cars, but a competitor made a complaint. Moreno pleaded guilty in 1991 to burglary, theft, and related offenses, and was sentenced to six to 23 months in jail. He pleaded guilty in 1995 in an attempted-theft case and was sentenced to probation, court records show. Tow-truck services in the city have stirred controversy before. The city instituted a rotational-towing system in 2011 after violent encounters among tow-truck operators competing for business. Last year, Pennsylvania Attorney General Josh Shapiro announced that the George Smith towing company in Philadelphia had agreed to repay 28 people whose cars it illegally towed. He said an investigation by the Bureau of Consumer Protection found that the cars were illegally towed from various locations and drivers had to pay $205 each to get their cars back.